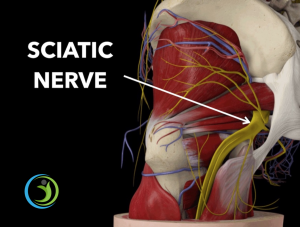 Pain caused by problems with the sciatic nerve must be diagnosed accurately. When the wrong problem is blamed for the pain nothing goes well and treatment fails. When you get the diagnosis nailed right from the beginning you make fast progress. The discs of the lower back start off as very strong, very robust cartilage that lives between each of the vertebral bones. Over time, if you ask your discs to do more work than they are capable of coping with, the cartilage becomes weaker and breaks down. Two of the biggest factors that can contribute to this problem are sitting too much and lifting inappropriately in a repetitive environment. This literally degrades the disc until it can no longer handle the pressure, and injury occurs. This is a very common problem that patients with lower back pain or leg pain have and often goes undiagnosed. As the nerve leaves the pelvis it runs underneath the piriformis muscle and on top of the deep muscles of the hip. Because the nerve runs at right angles to these muscles, it is prone to developing fibrous bands (adhesion). The adhesion literally sticks the nerve to the muscles which causes irritation of the nerve and flexibility problems with the leg. 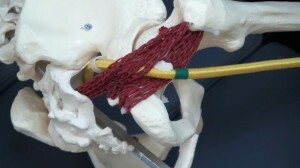 This model shows an example of adhesion sticking the sciatic nerve to the deep muscles at the back of the hip. This pathology is commonly missed by therapists and will make all the difference for you if this is part of your problem! As you can see the two diagnoses above can share a lot of the same symptoms, and there is nothing to say that you can’t have both at the same time. So as I say a lot on this blog, getting the correct diagnosis matters a great deal. There are lots of pathologies that can effect the lower back, hips and legs. Guessing or simply applying a random treatment will not work. Generic things like stretching, gluteal “activation” exercises and spinal manipulations are good examples of poorly selected treatments. These are the foundations of clinical excellence that we apply every day at Soft Tissue Solutions. We have helped thousands of patients achieve their goals and get back to living a normal life with less pain and more happiness!